Yesterday I spent a few hours making recycled cards. One is for the Arbor Day Challenge with the EtsyPaper Team. It's now in my shop. I also made a few more for two swaps I'm in -- a notecard swap (theme is flowers, trees...) and a knitter's Earth Day swap on Ravelry. The cards are made with torn paper from recycled catalogs. Once the flower was glued on the card (also recycled paper), I lettered the quotation with a brush and liquid watercolor. This has always been one of my favorite quotations.... and perfect for spring. Yes! 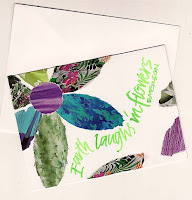 I like to tear collage flowers too my friend!